Tell us a little about Minna, Minna! Next year I will be celebrating 10 years since the launch of Minna! When I moved to Dorset from London I loved strolling around the vintage markets with my baby girl. I have always had a love affair with lace, so I started making little lace tops that found their way into some well known boutiques. As I moved back to London, I put together a little capsule collection that secured me a place to show my collection to buyers at the London Fashion Week. What started as a hobby grew into a proper business very quickly. The focus was always on using lace fabrics which made us very different from other brands, but when the recession hit we launched our specific bridal range. 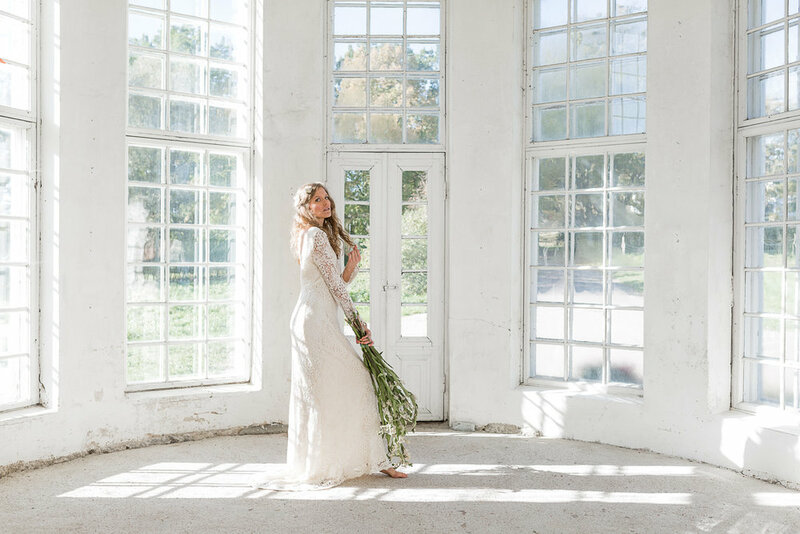 When we started, there was not much on the market in terms of alternative wedding dresses - things have changed hugely since then and nowadays there is so much amazing talent out there. Having said that, I think as long as you stay true to your style and design ethos, you will attract the customers you want to work with you. Definitely winning Elle Style Awards in Finland for sustainability!!! What do you think the most Curious couples will love about your designs? We have been part of the Most Curious family since day 1, and I always feel that the couples who come are the ones that are looking for something different. Our dresses appeal to customers who want to be part of the process of making the dress and put their own stamp into our designs. They also love the fact that they get to meet the person who makes their dress. That is the beauty of working with smaller companies, everything is more transparent, intimate and personal! We are just excited to see as many brides as possible. We will also be launching our new accessories collection at the fair so this is a great opportunity for us to show the collection and get feedback. I love the creative part although, it is the part that we get to do only very little these days. I am just grateful that my little business that started as a hobby has flourished. I have also met so many incredible people over the years. The bridal industry is a very supportive one. I have not come across any bitchiness. Finally, I love the fact that we get to make dresses that play such a huge part on someone's life. If you want to see the lovely Minna's designs and be the first to try on her brand new accessories collection, make sure you grab your tickets from our online shop now! Anyone who visits their stand will be able to get a discount code redeemable on their website - you're absolutely welcome.